Wednesdays July 18 – August 8, 2018. Registration 7:15 pm. Class at 7:30 pm. Designed for those who have some basis in Salsa who want to develop the Foundation to be Excellent. Foundation Means SKILL. Skill Means GOOD! Wednesdays, Nov 28, Dec 5, & Dec 12, 2018. NO CLASS November 21 Holiday. Classes Resume Wednesdays Beginning January 9, 2019. 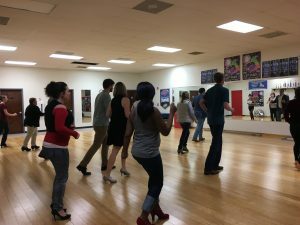 Have Fun & Meet People while Learning Salsa! This Series Focuses on Latin Movement, Connection, Footwork, Right Turn Family, and Cross-Body Leads. Includes Free Student Practice Session. Please Register 24 hours in Advance. Walk-ins Accepted. COST: $50 for 4 classes Per Person/$90 for 2 people. Bring a Friend & Both Receive $5.00 off Purchase of 4 weeks. $15 pp Drop-In. **No Partner Required. No Experience Needed. An intensive one-on-one or one couple lesson focused just on you! Clean up your technique, timing, spinning, leading, following, etc. Or get a jump start as a beginner. Available for individuals, friends, and couples. Maximum: 2 people. $65 for 1 hour, Purchase 4 for $225.00 (up-front) SAVE 14%! Gentlemen: Please wear shoes with a smooth bottom such as dress shoes. No shoes with tread. No tennis shoes or flip flops. Ladies: Please wear shoes with a smooth bottom, a heel (your preference), and a back. No flip flops, slip-ons, or tennis shoes.